Eris Morn is the new and rather mysterious Vendor in the Tower. She's the remaining survivor who originally faced Crota and now she freely offers you Dark Below quests and armour. Players hoping to upgrade their new Raid gear will also rely heavily on Eris for her material exchange services. Eris provides the direct route to the awesome Murmur weapon via one of her side quests. Those familiar with the Dark Below will know that the Murmur is one of the first weapons which can change type from Common to Rare and finally to Legendary status. It also has a great perk which allows players to swap damage type between Solar and Arc - perfect for the Hive. Similar to the Bounty Tracker in the Tower, Eris offers many Bounties. Every Bounty you complete earns you reputation points that can be used to unlock some of Eris' gear and materials. 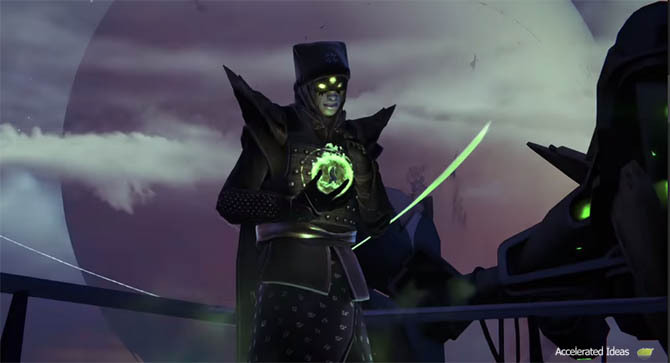 Reputation for Eris is called Crota's Bane reputation. Due to her hatred of the Hive (based on past experience) the majority of her Bounties require you to kill Hive enemies in some shape or form. So you're going to spend a lot of time on Earth and the Moon. She also splits some Bounties into classes, so that only a guardian of that type can complete them. For example, there's a Bounty called "Bonebreaker" that requires the player to kill Hive Wizards with Shoulder Charge. Not only is that seriously difficult but only a Titan could complete it. A slight variation on Bounties, Quests are several tasks bound together, usually with the next task being unlocked after completing the previous one. Unlike simple XP and rep gains from Bounties, completing all the chains in a Quest will give you a special reward in the form of a new Legendary weapon or armour piece. 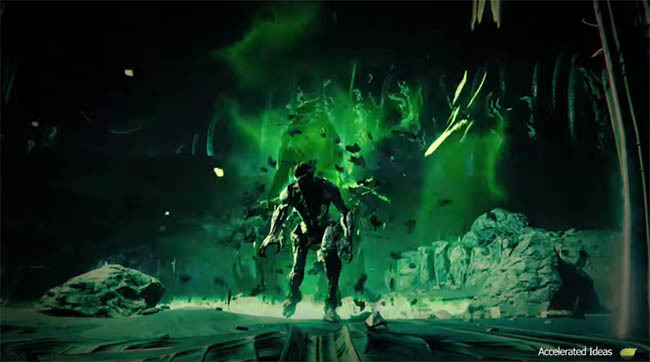 Fist of Crota - Face the Fist of Crota leading the Spawn on Earth. Bounties are usually straight forward but Quests have a varied and challenging set of sub quests. Some of these require you to use weapons with the "wrong" damage types e.g. Void vs Wizards. Whilst others put you in the middle of danger by asking you to kill Cursed Thralls (those exploding enemies) using only your melee attack. As you can imagine, completing Eris Quests requires alot of time, patience and skill. Not only does Eris sell weapons but she also rewards you with free weapons for completing specific Bounties and Quests. Some of these have precursors, i.e. you must complete the preceding quest before the next one becomes available. Just like an Exotic bounty. Following a similar pattern to other Vendors, players must earn reputation from Eris before weapons and armour are unlocked for purchase. Thankfully, there are many quests on offer from Eris so gaining rank isn't too much of a problem if you like killing the Hive! One of the first free weapons from Eris is the Murmur fusion rifle. She will reward you with this weapon for completing the first Quest called the "Fist of Crota" which consists of 3 sub quests. The final sub quest called "The Wakening" asks you to destroy Crota's Soul where you face a bombardment of Thrall and Knights. Upon completing this quest and returning to Eris you receive the new weapon. I strongly recommend that you give the Eris quest a go before venturing into the Raid because the Legendary Mumur Fusion Rifle is an excellent Hive weapon. It outshines the Pocket Infinity and already comes with the new higher base stat of 272. One of it's starting perks allows you to switch between Arc and Solar damage making it the perfect compliment against Knights and Wizards. Interestingly, Bungie locked the "Will of Crota" strike behind Eris' quests. 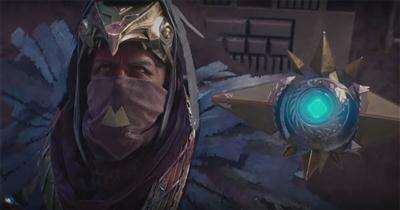 Players must complete a certain set of quests to unlock the Strike and subsequent Weekly and Nightfall. The Fist of Crota is the first quest given by Eris and you should have no problem completing that. Killing 25 knights is also fairly easy, I personally used the downstairs room to the left of the Earth Patrol spawn. You can repeatedly walk in and out of the spawn point to get a new Knight to spawn. It's also a good place for upgrading your new Legendary armour sets. Terrestrial Complex - head through the building above the Skywatch loot cave (you all know where that is!). Take an immediate right turn and follow the route outside. Apart from selling the usual Heavy and Special Ammo Synthesis packages, players can also dabble with the brand new upgrade materials. The most common of these are Radiant Energy and Radiant Shards which are the new materials required to upgrade Crota's End Raid gear. Besides these, there are two other materials of interest; the "Embalming Orb" is specifically used to upgrade Hive weapons whilst the "Runed Core" will literally transform weapons from one rarity to another. Used to upgrade weapons of Hive origin. i.e. weapons that came from the Crota's End raid. Acquired from: Exchanging 10 x Black Wax Idols. Used to upgrade Raid weapons. A replacement for Ascendant Energy which is still useful for pre-DLC weapons and Vendor weapons. Acquired from: CE Raid chests and rewards. Used to upgrade Raid armour. This material is a replacement for Ascendant Shards which are still useful for pre-DLC armour and Vendor armour. Used to upgrade weapons gifted by Eris. Note the use of the word gifted here. This material is used to transform some of the weapons that you're given by completing quests for Eris. For example, the Murmur weapon can be upgraded from its Common type to Rare and Rare to Legendary. Acquired from: Exchanging 5 x Black Wax Idols. Eris is conveniently located to the left of the players spawn point at the Tower. Walk past the building where the Postmaster resides and near the balcony (where the ships arrive) you'll find Eris.